Transparency Market Research states that the competitive landscape present in the global wireless access control market is highly fragmented. The prominent players in the global market are Bosch Security System, Johnson Controls Plc, ASSA ABLOY Group, Salto Systems K.S, and Dormakaba Holding AG. Of these, Dormakaba Holding AG and ASSA ABLOY Group held a leading share in 2016. Companies are expected to make result-oriented investments in expanding their business in the near future. 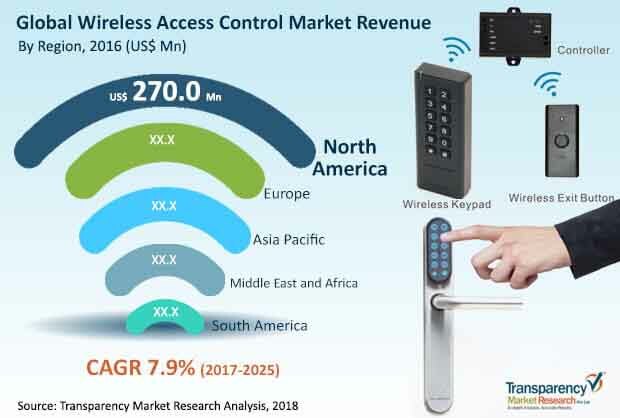 Developing markets of the world are expected to offer several lucrative opportunities to the companies operating in the global wireless access control market. The upcoming residential and commercial segments of emerging economies are expected to create a new platform for expansion of the global wireless access control market. According to Transparency Market Research, the global wireless access control market is likely to be worth US$1,657.0 mn by the end of 2025 from US$830.37 mn in 2016. During the forecast period of 2017 and 2025, the global wireless access control market is expected to surge at a CAGR of 7.9%. In terms of application, the non-door access control segment is projected to lead the global market with a CAGR of 12.9% between 2017 and 2025. Regionally-speaking, Asia Pacific is expected to exhibit a CAGR of 9.3% in terms of revenue as service industries of emerging economies are likely to invest in better security measures. Growing adoption of wireless technology has created a positive environment for the wireless access control market. This security measure has become a universally adopted standard. One of the main difference between wired and wireless access control is wireless access control does not require signaling and power cables for its operations, as it is operated on batteries and the communication part is done through transceivers or through cloud access. The main advantage of wireless access control system is its ability to integrate with existing access control system and other security systems like video surveillance, intrusion detection, fire alarms, and others. Wireless access controls systems is being continuously upgraded with new innovative components. For instance, the use of smart phones for access controls and the use of electronic door locks. One of the key trends in the wireless access control is the wide adoption of access control in the residential market due to rising security concerns. Wireless access control systems are mostly preferred in residential as it does not require cabling and wiring and thus the interior of the house is not disrupted. Also the use of smartphone in access control can further drive the wireless access control market. In the coming years, the global wireless access control market will be highly driven by the growing number of technological advancements. The inclination toward creating a modern living, especially in the developing economies, is expected to fuel the growth of the overall market. Analysts anticipate that the growing dependability on technology and elimination of human error in ensure safety is also likely to increase in the adoption of wireless access control components in the forthcoming years. Despite the strong market drivers, the global wireless access control market is likely to be inhibited by a few factors. The key factor restraining the global market is the high cost of implementing wireless access control in any organization. The reluctance toward changing conventional formations of access control has also been identified as a restrain to the market. Furthermore, the process of implementation of modern wireless access controls is also likely to restrain market growth. This review is based on Transparency Market Research’s report, titled “Wireless Access Control Market (Component – Hardware (Readers (Biometrics, RFID Tags and Readers and Mobile Credential), Locks, Transceivers, and Batteries), Software and Services; Application – Door Access Control and Non-Door Access Control; End-use Industry- Residential, Commercial and Institutional) – Global Industry Analysis, Size, Share, Growth, Trends and Forecast, 2017 - 2025”.